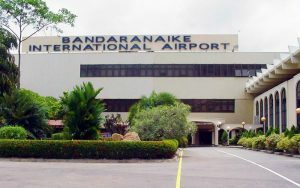 A close relative of Makandure Madush and five other suspects who were deported from Dubai were arrested at Bandaranaike International Airport today (17th) morning. They had been arrested in Dubai with drug racketeer Makandure Madush during a birthday party. The suspects arrived at BIA at 4.45 a.m. this morning in the UL 226 flight. They were taken under the Criminal Investigation Department at the Bandaranaike International Airport for further questioning this morning.